Torksey Viaduct. Copyright Tim Heaton and licensed for reuse under this Creative Commons Licence. Straddling the River Trent, Torksey Viaduct is a rare and early example of a tubular box bridge. 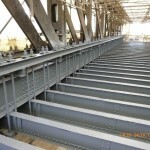 The bridge consists of 2 equal box girder spans supported on a single central pier and double side piers. It was completed more than 150 years ago as part of the Manchester Sheffield and Lincolnshire Railway, but it took the engineer Sir John Fowler 4 months to convince the Railway Commissioners that it was strong enough. It closed in 1959, and has been out of use ever since. It is grade II* listed and on the Heritage at Risk register. Torksey Viaduct was officially opened as a walking route on the 22nd April 2016 by Sir William McAlpine, Chair of the Railway Heritage Trust. The viaduct creates a new link across the River Trent between Nottinghamshire and Lincolnshire, giving people the chance to explore the area on foot. Sustrans plans on extending the route to enable it to be used for cycling too in the future. Refurbishment of the viaduct took 18 months, with the help of funding from the Railway Heritage Trust. The restoration involved protecting native species including barn owls and badgers who had made the viaduct their home after it being out of use for over 50 years. 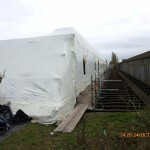 Photos below show the refurbishment in process, and some interesting visitors. 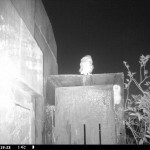 Fortunately these barn owls were discovered on a different part of the bridge to where the works were to be carried out. We sought and followed expert ecological advice to ensure the birds were not disturbed.